It is generally good practice to spend time with your flock on a regular basis (as if you don't already! ), apart from the regular feeding and cleaning, but really observing them, so that you know what is 'normal' and immediately notice any changes in appearance or behavior. The faster you can identify a health issue and treat it, the better. Chickens, being the ultimate prey animal, are masters at hiding symptoms and often by the time you notice something is wrong its too late. 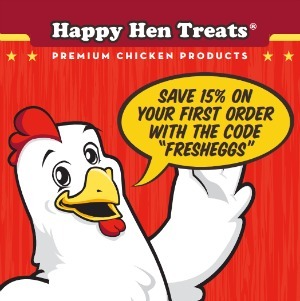 Take the time to pick up each chicken and give her a good once-over. Look for anything out of the ordinary. Also judge how she is acting - calm and content or ruffled, uneasy or even possibly in pain. 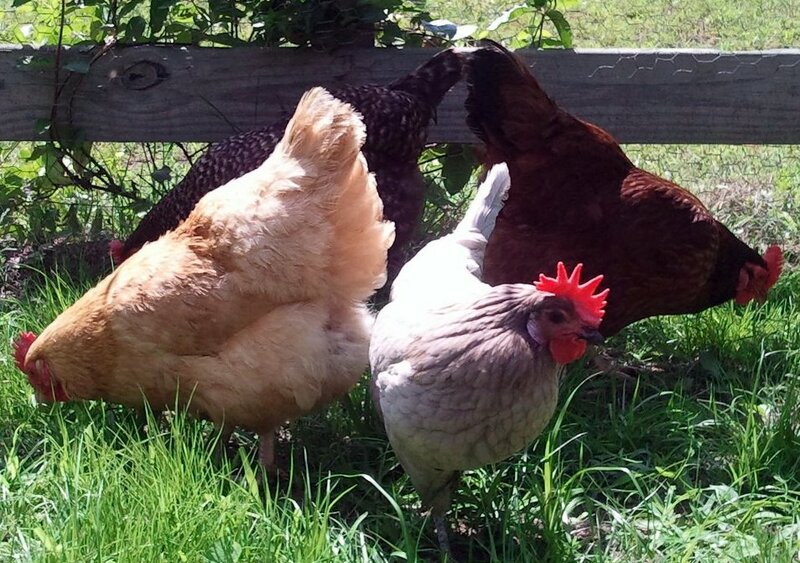 A thorough 'comb to toe' checkup of each chicken every other week or so can help nip any potential problems in the bud before they become real problems. 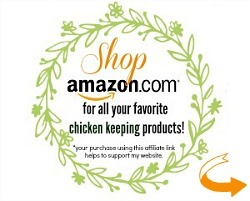 This will greatly enhance not only the health and happiness of your chickens, but also maximize their productivity and life span. I just finished my checkup of everyone this past weekend ...they all got a clean bill of health. 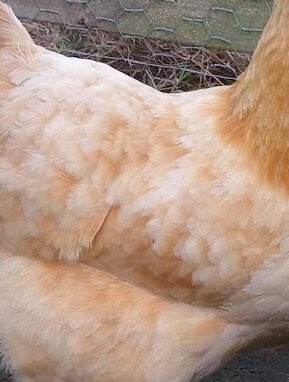 You want to see a nicely-colored rosy comb with no black spots, which may indicate frostbite in the cold weather (or if the tips are black or grayish), pecking by other hens, or the more serious fowl pox in the warm months, which is transmitted by mosquitoes. 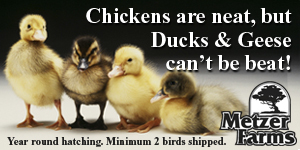 There is no treatment for fowl pox but the affected bird should be separated, kept warm and given extra nutrients. 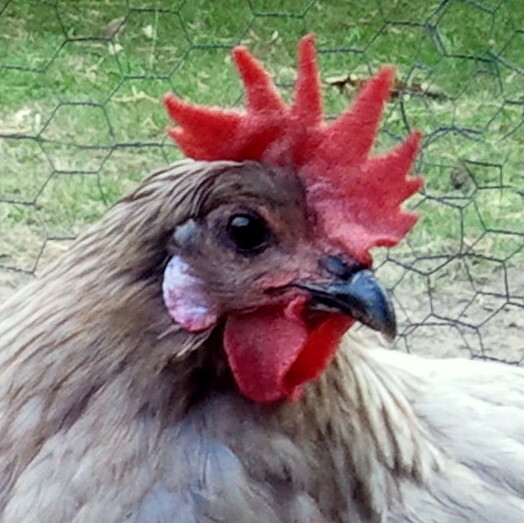 If you suspect pecking, spray the comb with Blu-Kote to prevent further pecking. 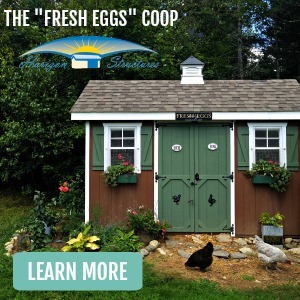 Damp conditions can lead to frostbite, so even in the winter, your coop needs to be dry and well-ventilated, with airflow up high above the height of the roosts. Coconut oil carefully slathered on the frostbitten comb can also help prevent further damage and aid healing. Don't break off the frostbitten tips because they help protect the comb underneath, however, sometimes infection can set in, in which case the comb will need to be trimmed. 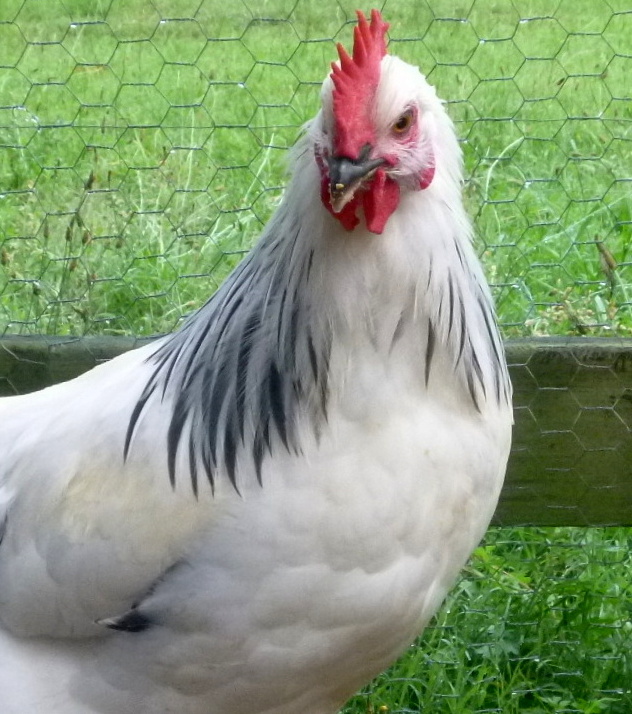 A pale comb can be a precursor to heat exhaustion or can also just mean your hen has just laid an egg. The act of laying draws all the blood to the vent area and away from the comb and wattles. The color should return momentarily in that case. Swollen, pus-filled or watery eyes, or eyelids that are stuck together can be signs of eye worm. Sometimes the worms are even visible under the lids, swimming around. (Sparing you all the gross details, it's basically a worm contracted from cockroaches.) 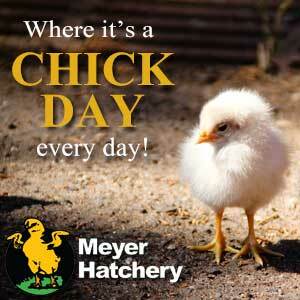 Your chicken will begin to scratch at its eye with the tip of its wing and could literally scratch her eyeball out. Eye worm treatment is easy with VetRx. Add 1 teaspoon of VetRx to a cup of warm water. Wet a cotton ball with the mixture and then liberally dab onto the roof of the chicken's mouth, holding the chicken almost upside down, so the pus will drain from the eyes. The water mixture should come out of both sides of the beak also. Repeat daily until the eye clears up. Wheezing, watery eyes and nose, squeaking noises, sneezing or coughing can be the signs of respiratory problems. 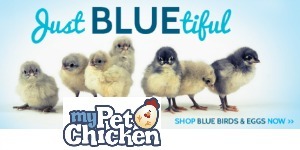 Chickens are extremely susceptible to respiratory illnesses. Often times it is nothing more serious than dust or other debris in the eyes or sinus cavities, or something lodged in the throat. Try massaging the throat and giving the hen a drink of water or olive oil. Normally, antibiotics are recommended, but I prefer to try going the holistic route first. Often a squirt of saline solution in each eye several times a day, VetRX in each nostril and an eyedropper of Nutri-Drench orally will help clear up the problem. If the symptoms persist for more than a few days, it could be something more serious an antibiotics may be necessary. You should be able to feel the breast bone, but it should not protrude. This is a good check of overall health/weight. 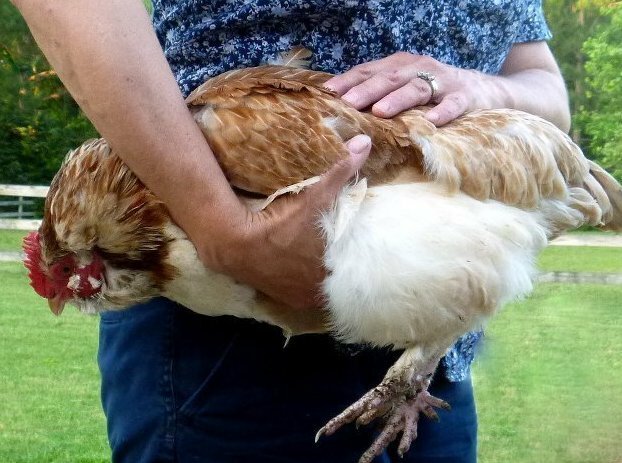 A featherless breast can mean that you have a broody hen or it can signal Breast Blister which occurs in the heavier breeds from rubbing against the roost. If you do see a blister, you should drain the blister, treat it with some coconut oil to soften and heal the skin tissue and then wrap the roosts with soft cloth to prevent further blistering. 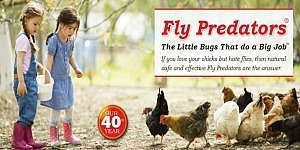 Check under the wings for mites, lice, ticks and other parasites. 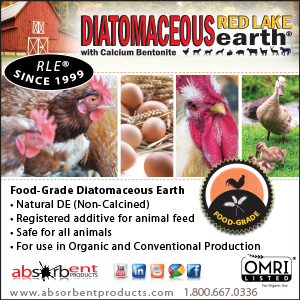 A soak in a tub of warm water,salt, white vinegar and dish detergent followed by a good dusting of food-grade Diatomaceous Earth is in order if you see anything creeping around under the wings. 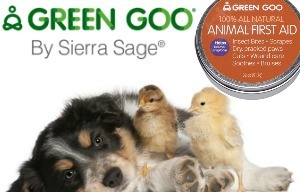 Remove any ticks you find with tweezers and apply some Green Goo. Adding fresh garlic to your hens' diet or garlic powder to their feed is thought to help make their blood less palatable to parasites. You can also spray the areas where you see the mites with garlic juice. 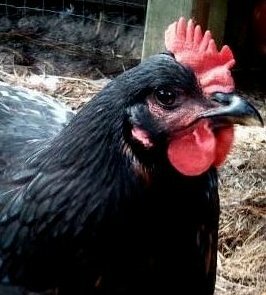 Also check for raw skin or missing feathers, since an over-zealous rooster will often do damage as will pecking order issues, and the areas under the wings are generally hidden from view. Any raw areas should be sprayed with Green Goo. 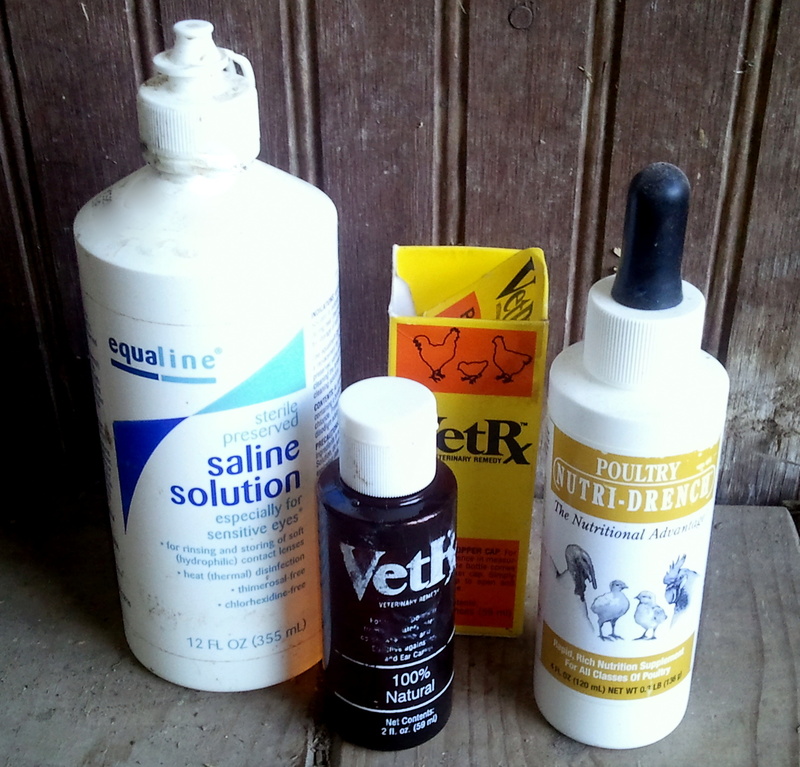 to prevent further pecking or covered with a hen saddle. The vent should look pink and moist. 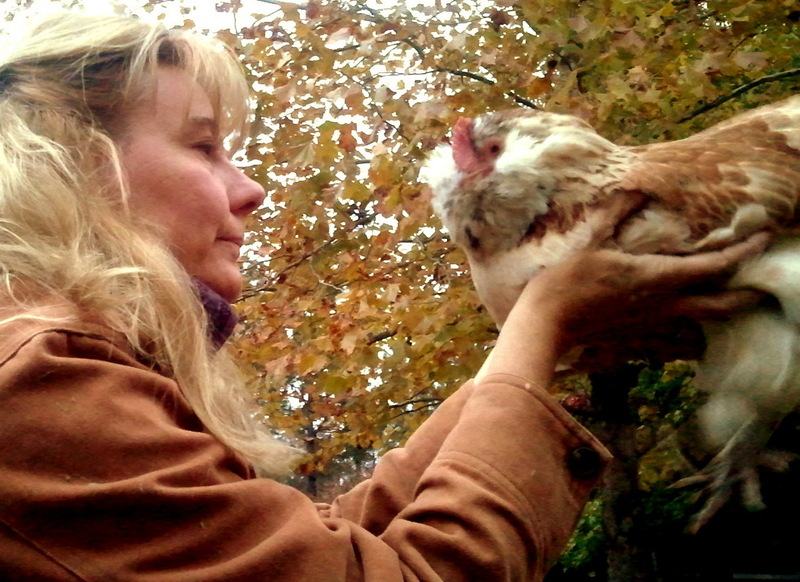 A dry, pale vent indicates a non-laying hen. Any accumulated balls of poop should be removed with some warm water - or trimmed in extreme cases. Adding probiotic powder to the feed can help alleviate future accumulations of feces. Droppings with blood or yellow foamy droppings could be coccidiosis which can be treated with amprolium/antibiotics or a holistic remedy called Kocci Free. 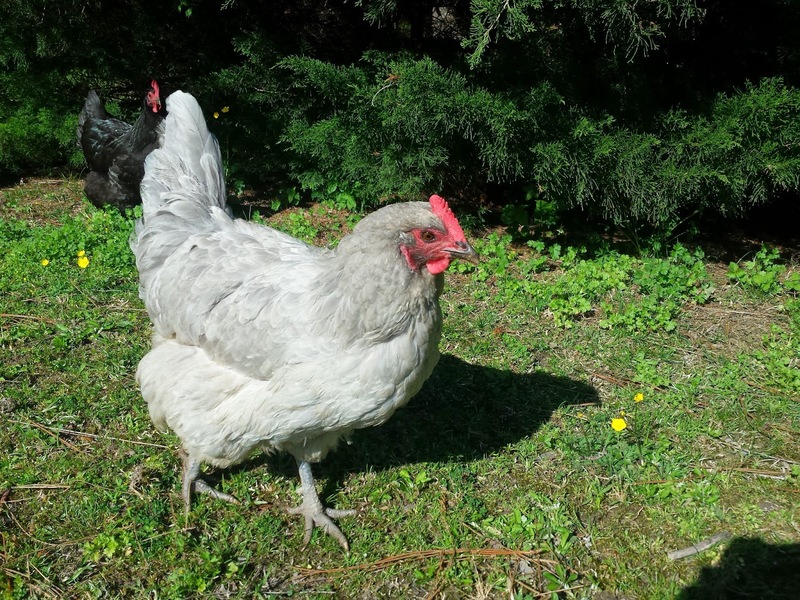 Recent studies show that probiotics, green tea and plum powder can help combat coccidiosis as well. 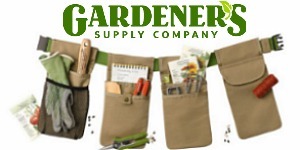 Greenish droppings might be worms (or indicate that the chicken has eaten a lot of greens, weed, grass or vegetables). White, milky runny droppings could indicate worms or an infectious disease. Internal parasites (worms) can often be seen in the stool. Natural worming treatments can be used twice yearly as preventatives and remedies. Brown runny droppings usually signals E. coli infection. Clear or watery runny droppings could mean stress, infectious bronchitis or more than normal water intake (due to heat). Grayish white droppings and an odor around the vent usually indicates vent gleet (a chronic disease of the cloaca of domestic birds) which is a fungal infection or a side effect or a bacterial imbalance in the intestines. A quick check for external parasites (mites, lice, ticks) is also important in the vent area. 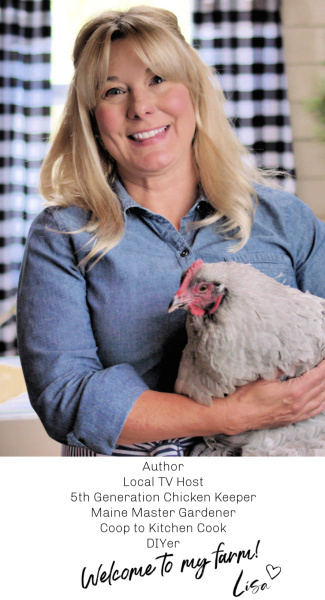 If you do see any parasites on any of your chickens, it is also imperative to do a thorough coop cleaning and dust the coop floor, roosts and nesting boxes with food-grade DE before adding new bedding. Legs should be smooth and brightly colored (except on the black- and slate-colored leg breeds). 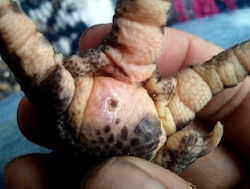 Flaking or raised scales can mean scaly leg mites. 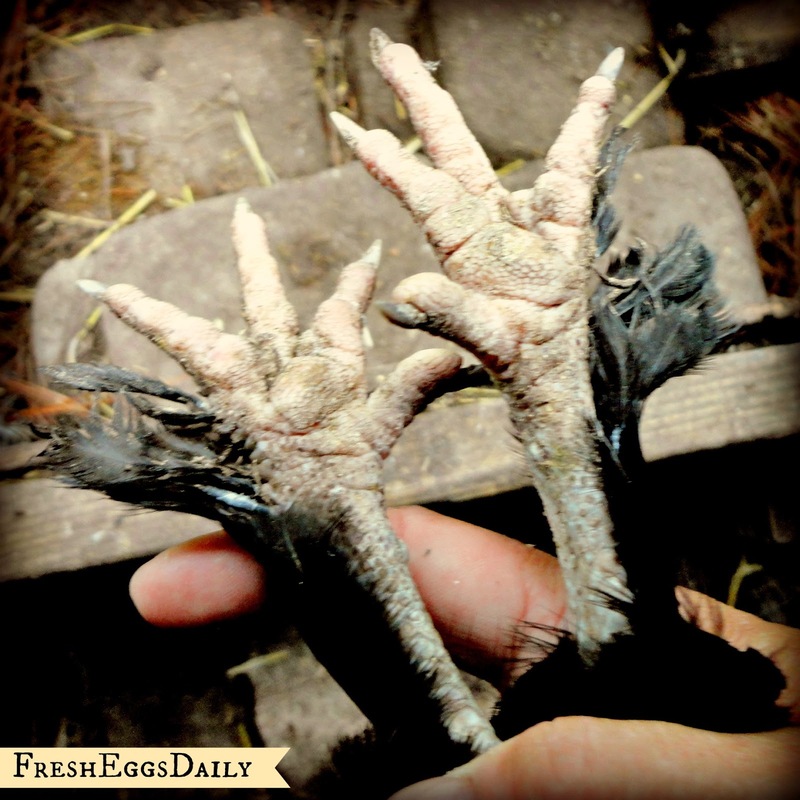 Soak the legs in warm water, then scrub gently with an old toothbrush dipped in white vinegar or garlic juice. Then slather with olive oil or coconut oil with a few drops of orange essential oil mixed in. Obviously any limping should be further explored, but if not caused by a cut or other visible injury to the foot, is most likely due to a hard landing off a roost and will go away in a few days. Puffy or warm foot pads can mean a splinter in the bottom of the foot that will need to be removed with tweezers. Feathers should be glossy and unbroken. 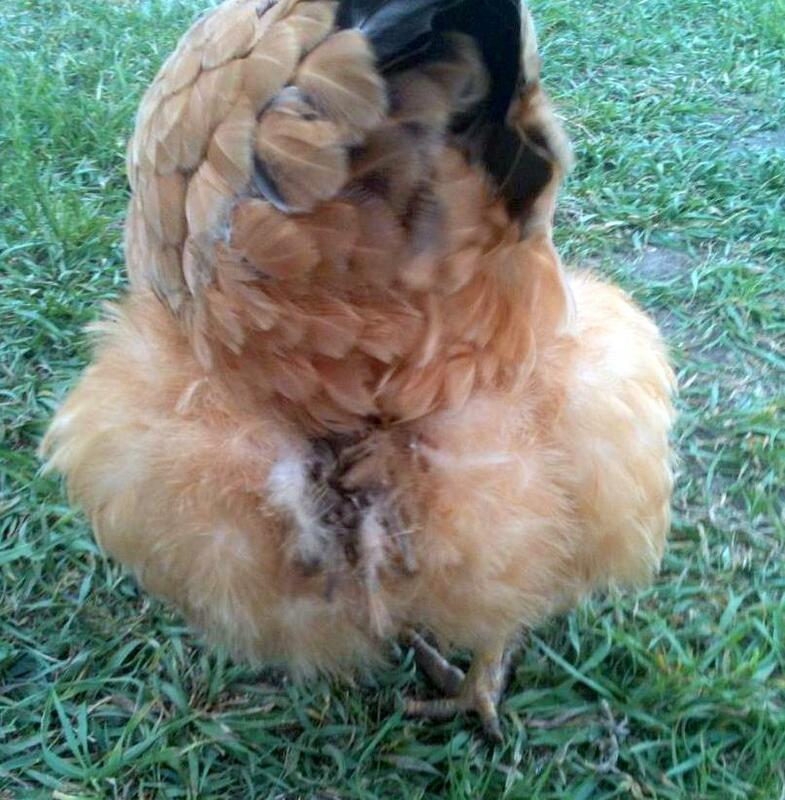 Broken or chewed feathers can signal a protein deficiency within the flock and added protein should be fed until you see the problem reverse. Good sources are scrambled eggs, meal worms and cooked meat scraps. 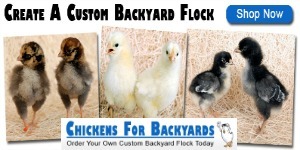 Broken feathers can also be a sign that rodents are getting into your coop and chewing on your birds while they sleep. 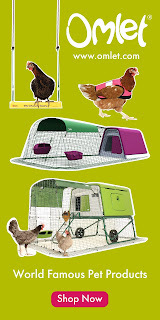 The coop should be examined and any spaces larger than 1" should be covered up. 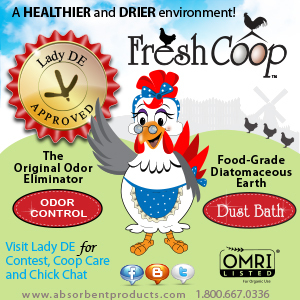 If you think a hen has eaten something toxic, you can try a laxative flush. A pint of molasses added to a 5-gallon waterer full of clean water for 8 hours will help cleanse the stomach and intestines. 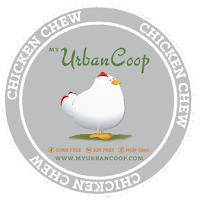 By taking a few minutes to examine each chicken comb to toe every few weeks, you ensure that they stay in tip-top shape. 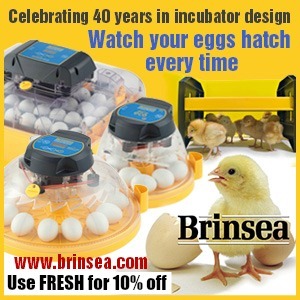 Of course, as Ben Franklin said 'an ounce of prevention is worth a pound of cure' and keeping your chickens healthy with strong immune systems is well worth your time and effort. Bookmarked to refer to. Thank you for this! Ditto. Thank you for this helpful post. 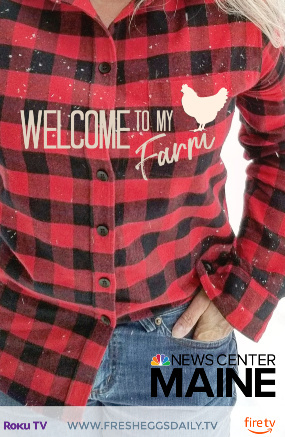 I think I'll post it in my shed by my coop. Great idea! Put it in a clear plastic binder sheet so it stays nice. Great wealth of info in one handy place! Thank you for putting this together. Adding it to my files. 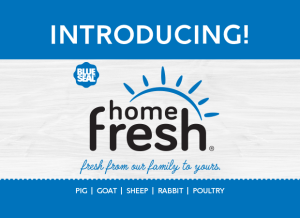 Great stuff (yet again) can the chickens take tea tree in the salve? I like is as a bacterial and staph preventing agent. Most of my birds don't fuss when I hold them but I have a couple that do. 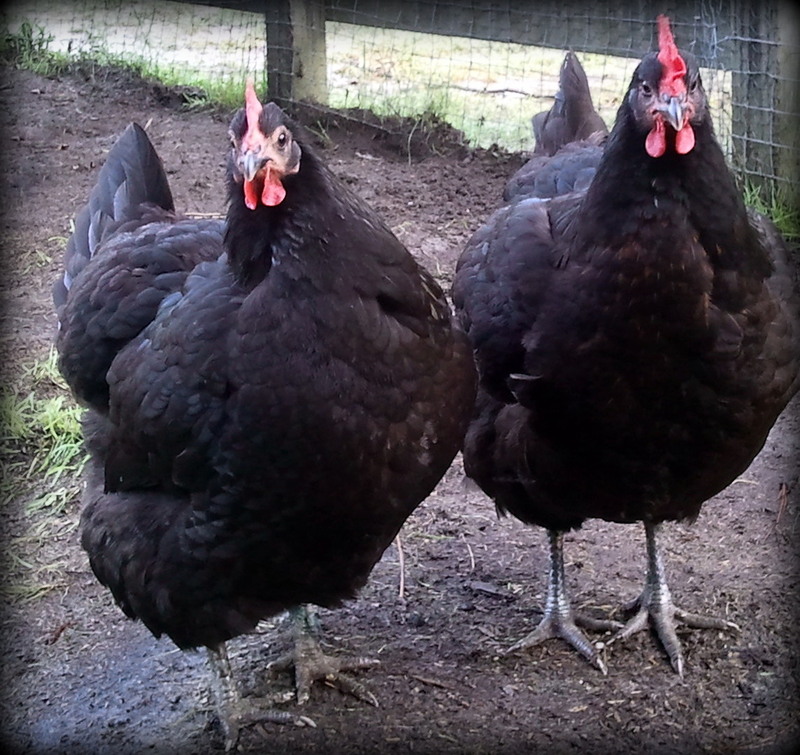 I am new to chicken keeping they are 13 weeks old. What are some tips for being able to examine them thoroughly and if need be work on them. 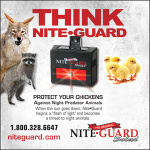 Easiest way is to wait until they have gone to roost at night and then use a flashlight to check them over. Not optimal, but if they are skittish, its far easier that way.